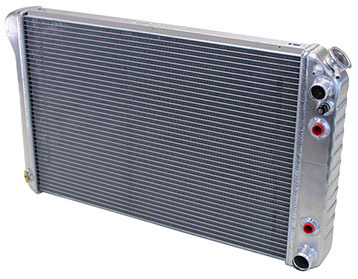 We now offer conversion radiators specifically designed for your GM truck with an LS engine and manual transmisison. They feature all aluminum construction, but unlike others on the market, they have beautifully stamped tanks with strengthening indentations just like your original. They're a double pass design putting the inlet and outlet on the same side which greatly simplifies plumbing to the engine. The all important steam port bung is welded into the upper part of the tank which lets your new LS engine vent properly. They also include a coolant temp fan switch in the tank as well as a billet radiator cap. Excellent restoration type quality made in the USA. Available in bare aluminum or black.